Gumshoe Santa is a bonus short story for the collection Broken Christmas. And because you are reading this, you have a chance to read it! At the end of Broken Christmas, there is a Secret Santa Cyphered message. By emailing that message to Mr. Henderson at info@phcbooks.com, you will receive a copy of Gumshoe Santa for yourself! There are some kind people left in this world. Oscar personifies that. Oscar is a private investigator hired by Andrea Fox to provide photographic evidence that her husband is not being loyal to their marriage. Due to a pre-marriage agreement, her husband having an affair is the only way she will make out with part of his fortune in the event of a divorce. There is only one problem – Mr. Fox was as faithful as they come. Oscar could not obtain photographic evidence, so he was paid a lot of money to frame Mr. Fox. Instead, he discovered another secret about the couple that will end up coming out instead. He does not want to ruin a whole family on Christmas Eve. So, because he looks like Santa Claus, he brings their child a toy that has been sold out in al stores in order to keep the Christmas spirit alive. It is a sweet little story. I wasn’t sure where it was going or how it was going to end up, but once I got to the end, I was very satisfied with how it turned out. 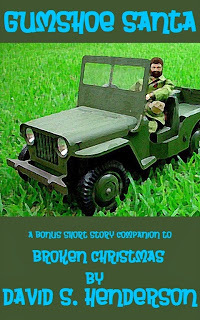 Read Broken Christmas and find the secret code to get this story, you will not regret it.